The tapestries and textiles conserved at Talisman are primarily woven fabrics of natural fibers. They may be of any age or technique - from pre-Columbian South American to Central Asian to Indonesian. Typically these are flat textiles, but some three dimensional costumes and modern fiber art are also accepted. In these photos a Yuan Dynasty (circa 1200 AD) crown of a court princess is being reconstructed. The bark core has deteriorated and has been replaced with an exact ethofoam replica made by us. We exhibited this 13th century Guguguan crown in Hangzhou, China along with accompanying robes that were also cleaned and conserved at Talisman. European textiles such as Flemish and French tapestries are cleaned, restored and prepared for hanging. 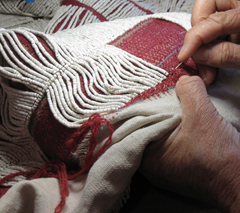 Early Indian block print, painted or resist-dyed textiles are also cleaned and restored - tears rewoven or patched and holes backed with cloth. In the event of holes, the design of a textile may be applied on the visible part of the backing cloth in order to improve the appearance. At Talisman, textile restoration is recognized as an art, as well as a science. As with Oriental rugs, both preservation and presentation are paramount. 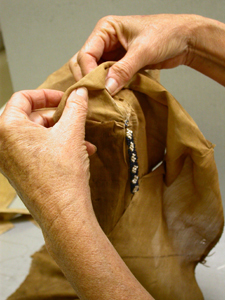 This phot depicts the conservation of a Taiwanese tribal beaded Atayal coat. Some damaged red wool is being replaced. The shell beading was restored with antique beads that were dyed and treated to reproduce the matte and pitted surface of the original beads. Textiles often have many accompanying materials such as beads, mica or metallic threads. Textile conservation requires a broad acquaintance with material science. The knowledge and sensitivity displayed in our textile work is also brought to Oriental rug restoration. No one else operating in this field can match our breadth of skill and experience. Cleaning depends upon an informed judgement about the condition of the textile fibers as well as an identification of the soil before actual textile materials are disturbed. Naturally, condition and soil vary considerably with each situation. 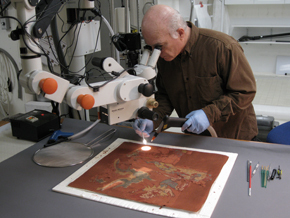 Here an early Han dynasty fragment is being cleaned with the aid of a surgical microscope. A lightly heated ultrasonic mist is being used with a vacuum to gently remove the crystallized debris. Textiles cleaned range from archaeological fragments to ethnographic costumes to contemporary fiber art. The same principles of textile cleaning are shared by our work with Oriental rugs. In the commercial sector, only Talisman is able to demonstrate its ability to clean the full spectrum of the textile arts - from archaeological textiles to Oriental rugs. Many tools, techniques and cleaning agents are used in order to meet the challenges of cleaning. All, or most, of the substances found in the material culture of humanity eventually find their way onto textiles and tapestries. The challenge is to improve the preservation and presentation of a textile - with no adverse effect. 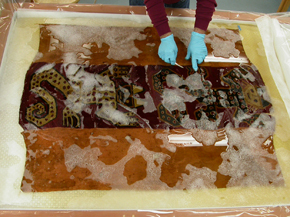 This photo shows a jaguar motif pre-Columbian Chimu textile being immersed on the textile table. Treatment tools range from ultrasonic needles to bone burnishers to dental tools to vacuum tables.